Chrissy is having an identity crisis. As a single women and convert to the Church, she has always managed to find her place in life- at least until someone else begins using her credit cards, her bank account, and, most important, her name. Now the real Chrissy must prove her innocence against a growing pile of collection notices and unpaid bills. But with no job, no money, a warrant for her arrest, and a closet full of high-heeled shoes, a girl can only get so far. When Chrissy meets Micah Heet, the other half of a blind date gone bad, the two discover they are facing the same battle and join forces to find the perpetrators. Little do they know that the small semblance of life they have left will be put on the line in the process. Chrissy Salazar has a good life: she is active in her church and adores her niece and nephews. It's not perfect: she's 35 and still single, her sister drives her nuts, and she's facing yet another blind date. However, when her identity is stolen, her life really spirals out of control. Suddenly, she has no job, no money, no credit and an arrest warrant. Micah, her blind date, has his identity stolen as well and the two embark on an attempt to clear their names. What happens next is nothing short of adventure. I loved this book. I read it in one sitting because I couldn't put it down. Chrissy has a great voice. She's smart and a little snarky and when faced with the reality that her name is on every creditor's hit list, she faces her fears and goes after the perpetrators. Her interactions with Micah are realistic. Her love for her family comes through, especially when her sister's choices affect her beloved niece and nephews. Micah, a single dad struggling with his ex-wife's issues, fights his attraction to Chrissy because he doesn't want to upset what little stability his kids have. Josi has done her research when it comes to identity theft and I found myself getting angry at the perpetrator who simply disregarded Chrissy as a person. I found myself angry at the police who wouldn't help her at first. Chrissy's fear is palpable, especially as she finds herself doubted by the police officers she asks for help. Josi has also done a great job of balancing the story with Chrissy's Mormon faith. Her Christianity is simply a part of who she is: the story isn't preachy or full of doctrine. I do wish there was more closure to the situation: I think the cashier who stole her information should have been arrested, especially after Chrissy and Micah figure out who did it. A fun story, with a definite element of adventure, but also a warning to be aware of your credit and your finances. information on identity theft awareness is included at the end of the book. Hershey. The name means chocolate to America and the world, but as Michael D'Antonio reveals, it also stands for an inspiring man and a uniquely successful experiment in community and capitalism that produced a business empire devoted to a higher purpose. One of the twentieth century's most eccentric and idealistic titans of industry, Milton S. Hershey brought affordable milk chocolate to America, creating and then satisfying the chocoholic urges of millions. He pioneered techniques of branding, mass production, and marketing, and gained widespread fame as the Chocolate King. But as he developed massive factories, Cuban sugar plantations, and a vacation wonderland called Hershey Park, M.S. never lost sight of a grander goal. Determined that his wealth produce a lasting legacy, he tried to create perfect places where his workers could live, perfect schools for their children, and a perfect charity to salvage the lives of needy children in perpetuity. Along the way, he overcame his personal childhood traumas, as well as the death, after a short and intensely romantic marriage, of the one woman he ever loved. In childhood, Milton was torn by the constant conflicts between his stern mother and starry-eyed father. He watched his father go bust in the oil fields and his sister die of scarlet fever. As a young man he failed with businesses in Philadelphia, New York, and Chicago. Milton finally succeeded in Lancaster, thanks to a caramel recipe copied from another confectioner and a lucky break provided by a British importer. Then, at the history-shaping Columbian Exhibition, Milton found the chocolate-making technology that would allow him to bring a new taste to America. When they heard about his plan to build a chocolate empire complete with its own little city in rural Pennsylvania, his friends said he needed a legal guardian. Ten years later, Milton controlled the U.S. chocolate market, and his town, Hershey, Pennsylvania, was the ideal American village. Factory workers lived in graceful homes. Their children attended the best schools. Local parks, libraries, and theaters rivaled the best in big cities. Trains brought thousands of tourists every day, who flocked to see the miracle town, the Hershey zoo, and an enormous amusement park. Not content with these accomplishments, a childless M.S. Hershey founded an orphanage for boys at his family homestead. After his wife Catherine's death, the press revealed that he had secretly willed his entire estate to the Hershey Industrial School, as it was called. This was only the beginning of his giving. Through the Great Depression, Milton Hershey used his fortune to fund a massive building program that kept all his workers employed and spared the community the real hardships of the era. Before he died, he even gave away his mansion, keeping just two rooms for himself. Remarkable as Hershey was, his legacy is even more powerful. It includes the $8 billion Hershey Trust (the single largest private fund for children in the world), an idyllic company town in central Pennsylvania, and a corporation that proves that the ideals of community and commerce can lead to profit. This first-ever, major biography of an American icon paints a vivid picture of what Milton S. Hershey accomplished as the ultimate progressive businessman. Hershey's life suggests a kind of capitalism that seems warmer, and more personal. He was a gambler, raconteur, despot, and servant. And he stands as a rare, and perhaps unique, example of ambition, altruism, ego, and humility. A fascinating look at the life of the man who brought chocolate to mainstream America. Milton S. Hershey's life is presented in an interesting, straight-forward manner. Hershey was raised in poverty as his father, always dreaming of something bigger and better, drifted from place to place. His mother came from a prosperous Mennonite family. Hershey's early business attempts were failures, but he persevered with his mother's family's financial help. The book is as much a history of industry, philanthropy, and business in the late 19th and early 20th century as it is a book about Milton Hershey. Hershey not only wanted to bring chocolate to the masses, he wanted to create a Utopian society and for a time, seemed to do that in what became known as Hershey, Pennsylvania. He and his wife were unable to have children and he formed a school for orphaned boys that continues to this day. While not authorized or sponsored by the Hershey company, I found it to be well-written and incredibly well-researched. My Friend Amy for a set of children's books. My Friend Amy for the Drama Queen books, including That's (Not Exactly) Amore by Tracey Bateman. I've been the recent recipient of some book giveaways. I don't win giveaways very often, so it's fun, and in the process, I get new books to read! From April at Cafe of Dreams I won The Questory of Root Karbunkulus by Kamilla Reid. Thank you! From A Book Blogger's Diary, I won The Badenweiler Waltz, by G. W. Kroeker. Thank you! I'm excited to read both, and my reviews will be posted here as always. This is my current nightstand. I'm nearly finished with Hershey: Milton S. Hershey's Extraordinary Life of Wealth, Empire, and Utopian Dreams, by Michael D'Antonio. I have plenty waiting for me when it's completed. Last year about this same time, I came down with a nasty case of pink-eye. Conjunctivitis if you want to get technical. Boy, does it hurt. I spent a cozy day wrapped in a blanket with some cocoa and Mr. Darcy. Right on cue, I have it again. I'm hoping it's not the contagious kind, but just the allergy kind. My allergies have been miserable and we had a wicked windstorm yesterday. I was out in it for a bit and I hope my eyes are simply irritated. We'll see. It sure hurts. I have my prescription from last time, so hopefully it helps. However, since I have the house to myself for awhile, I'm going to indulge in some recovery time. So, what do YOU do when you find yourself in a reading slump? How do you get out of it? Do you keep trying different books until you find one that draws you in? Do you just give in to the slump until it passes, and do something other than reading for a time? Do you ask for help? And, if you ask for help, what great (or, not so great) advice have you been given on how to get out of the slump? Perfect timing on this question. I've been in a bit of a reading slump myself, the last week or so. Last week, I only read two books, both of which I loved. I think it was partly due to the fact that school started and we were getting back into our routine as a family. I think it was also partly due to the fact that my nightstand stack didn't look too interesting. Sometimes I think you need to be in a particular mood to read a particular book. If I own the book, I can let it sit until it appeals to me. If it's from the library, as most of mine are these days, there is always a bit of pressure because of the due date. I've just learned that if a particular book doesn't appeal to me at the moment, I either set it aside or send it back to the library. I pick up a different one and hope that it is more interesting. Sometimes, too, I just need a break. If I've been on a reading binge, I often find myself wanting a bit of a break from reading. A day or two is often enough before I'm reaching for something else to read. 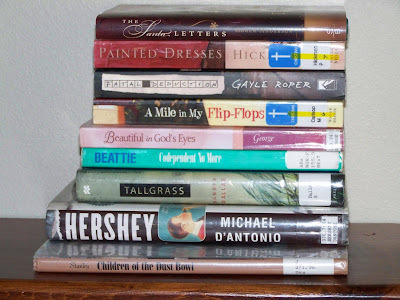 My boys went back to school this week, and my library stack hasn't seemed appealing. Sometimes you just need to be in a certain mood for certain books! So, I cruised through my Goodreads to-read list and my library website and reserved a few more books that I should be able to pick up next week. I really enjoyed Nothing to Regret, by Tristi Pinkston. Terrific. I read her new book, Season of Sacrifice in May and absolutely loved it too! I did finish a terrific Christmas book, but my review won't be posted until September 1st, as part of the book blog tour for The Santa Letters. You'll love it. A story of prejudice and acceptance, dignity under the worst conditions, and the power of the Atonement to heal us all. Ken Sugihara is my fictional character for this book, and he was a student at Berkeley at the time of Pearl Harbor. He is shocked to hear about the attack, but even more shocked when he discovers that all people of Japanese ancestry in the United States, especially those living on the West Coast, are now considered suspects in the attack. He and his parents are taken from their home and sent to a relocation center in the Utah Desert. Tristi Pinkston has a terrific way of understanding human nature. After the Japanese attacked Pearl Harbor in 1941, Japanese Americans living on the west coast found themselves persecuted for their heritage. Despite that persecution, Ken Sugihara, a student at UC Berkeley, tries to enlist in the US Army, only to find himself turned away. He soon finds himself turned out of school. The Japanese Americans lost homes and savings and found themselves shipped off to relocation camps around the country. Ken and his parents were sent to the Topaz camp near Delta, Utah. Ken is understandably bitter and resentful. Especially when he is asked to enlist in the Army and become a spy in Japan. However, despite all that has happened, Ken loves his country and accepts the challenge. What happens next will change his life forever. Tristi's research is phenomenal. She has truly captured the essence of not only the time, but the people. Ken's experiences in Japan affect his life and his decisions. Through his trials, he finds love and faith in God through the LDS church, and even the ability to forgive. Tristi does a remarkable job of weaving in Ken's conversion and Mormon beliefs with the story in a way that is not preachy, but one that is believable and touching. I read my own personal copy, but you can purchase the book here and here . This week's Booking Through Thursday asks about libraries. I don't have one particular memory of the library. I just remember going. A lot. I loved checking out books, I would get stacks and stacks and read them all. I'd check out my favorites over and over again. In school I would always get my work done quickly, so I could read. When I was in the 6th grade, I brought the math book home, did the whole thing and took it back and said, "There, I finished the math book, may I read now?" One day, my teacher called my mom to tell her that I was reading too much in class. My mom was incredulous and said, "You have a child who wants to read and you're complaining about it?" My teacher said that the reading wasn't the issue, but to the other kids, it looked like I wasn't doing my work, even though it was finished. My mom's reply? "Send her to the library." To this day, my favorite elementary school teacher was our librarian! From the time I was little, I wanted to be a librarian. I received a degree in English from Brigham Young University and planned to do their MLS program. Unfortunately, they discontinued the program the year I graduated. I would still like to do an MLS program, and now that my kids are both in school, I might. My boys love the library. We go quite often and they always have stacks of books to bring home. "All of their troubles suddenly seemed to disappear, for now they could see with their own eyes what they had only dreamed about for months, sometimes years. From two thousand feet above sea level they saw a vast stretch of orchards, endless fields of grapes, cotton, and tomatoes, and as far as the eye could see in any direction, green--so much green it was hard to believe after life in the Panhandle." From page 22, Children of the Dust Bowl: The True Story of the School at Weedpatch Camp, by Jerry Stanley. Check out other Teaser Tuesdays at Should Be Reading. I've had such a great week not only reading, but blog surfing. I've found so many new book blogs, added a ton of new books to my Goodreads list, and made some new friends. I read a charming little chick lit book: A Mile in My Flip-Flops. I read a good fictionalized novel about WW2 and a Japanese internment camp: Tallgrass. I didn't like an odd book about painted dresses and family drama: Painted Dresses. Check out other Sunday Salon postings here. Check out these great blogs for some book giveaways. Bookroomreviews for a copy of Sweet Life by Mia King, and a basket of chocolate. The Bookworm for a copy of Matrimony by Joshua Henkin. The Friendly Book Nook for a copy of Ruby Among Us, by Tina Ann Forkner. Sign up for the Family Reading Challenge at the Well-Read Child, and a chance to win a surprise grab-bag of books. Bookfoolery and Babble for Matrimony by Joshua Henkin. 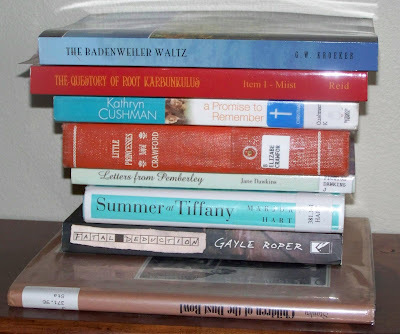 A Book Blogger's Diary for The Badenweiler Waltz by G. W. Kroeker. Check out the website for a review and an opportunity to ask the author a question. A Reader's Journal for Matrimony by Joshua Henkin. Bookroomreviews for a copy of Driving Sideways by Jess Riley. Bookroomreviews for a copy of Sweetsmoke by David Fuller. The perfect patch for Gretchen’s dilapidated plans? She’ll become a first-time house-flipper. As ideas go, it’s daring and genius. She’ll take out a short-term loan, buy a fixer-upper, renovate it, resell it, and use the profit for an adorable house of her own. What could be easier? But Gretchen’s plans to flip quickly flop when the house turns out to be in worse shape than she expected. She is relying on her retired contractor-father, but he wants to draw in his carpenter friend Noah Campbell. And although Noah is handy with tools, Gretchen isn’t so sure about the baggage he brings with him. Will she be able to loosen her grip on the tools when it seems Noah may be her only help? A whimsical look at color swatches, mismatched curtain rods, and the building of relationships, A Mile in My Flip-Flops reminds us that it takes faith to renovate the heart, as well as the home. Gretchen Hanover is a thirty-something kindergarten teacher whose fiance dumped her just before their wedding. After 18 months of consoling herself with ice cream and HGTV, she decides she needs to do something with her life. Her solution? To flip a house, just like it's done on HGTV. She convinces her dad to co-sign on a short-term loan and she purchases a disaster of a house. Gretchen's dad, in a bit of matchmaking, convinces her to hire his carpenter friend, Noah, to help the project along. Predictably, Gretchen learns a lot about herself and her relationship with God and, along the way, falls in love with Noah. A light, easy read with lots of little details about renovating, decorating, ex-spouses and best friends. The moral of the story? Life doesn't always go as planned, but trust in God and He'll take care of it. Carlson has a descriptive way of writing and it's easy to visualize her story. The title is a cute play on words. A charming, funny book: perfect for escapist reading. My Friend Amy is hosting a Book Blogger Appreciation Week, September 15th - 19th. It looks like a lot of fun. Check it out here, or by clicking the button on the sidebar. Rennie Stroud, a 13-year old girl, tells the story of what happens when a Japanese internment camp is opened in her small Colorado town during WW2. I found the story compelling. I loved Rennie's voice and those of her parents, who are, at first, some of the only people in town who accept the Japanese people. Rennie's father employs some young Japanese men on his sugar beet farm and the bond of friendship that forms between them all is strong. Predictably, the prejudice shown to these newcomers is strong and mean. When a good friend of Rennie's is murdered, the Japanese are immediately suspected, even though it is obvious that it was one of the angry locals. Although, which angry local is not apparent until the end. As in all Dallas novels, secrets are revealed and all isn't as it appears. The book is as much about Rennie's coming-of-age how the war shapes her perceptions of life, as it is about the internment camps. I'm rarely disappointed in a Sandra Dallas book, but I was disappointed in the rather abrupt ending. It was too sudden and left too many questions unanswered. I have no idea how historically correct this novel is, but it's certainly an engrossing read. In this story of sisterhood and unexpected paths, Gaylen Syler-Boatwright flees her unraveling marriage to take refuge in a mountain cottage owned by her deceased aunt. Burdened with looking after her adult sister, Delia, she is shocked to find a trail of family secrets hidden within her aunt’s odd collection of framed, painted dresses. With Delia, who attracts trouble as a daily occupation, Gaylen embarks on a road trip that throws the unlikely pair together on a journey to painful understanding and delightful revelations. Steeped in Hickman’s trademark humor, her spare writing voice, and the bittersweet pathos of the South, Painted Dresses powerfully captures a woman’s desperate longing to uncover a hidden, broken life and discover the liberty of living authentically, even when the things exposed are shrouded in shame. Let's see: well-written...check; compelling...no; interesting...check; did I like it...not really. I had high hopes that I would enjoy this novel. Set in the south, it's the story of Gaylen and her sister Delia. When their father dies, Gaylen returns to small town North Carolina for the funeral. Her marriage is in disarray and she needs some time away. She and her sister travel to their aunt's mountain cabin for some solitude. Her sister is a bit wacky and attracts trouble. Gaylen uncovers many questions about her deceased mother and the family secrets. At her aunt's cabin, she discovers a collection of painted dresses: actual dresses her aunt mounted and painted over or embellished, and then framed. Each dress is marked with a note of to whom the painting should be given. On the run from a hit man after her sister, the two of them embark on a journey to return the paintings. Along the way they have some adventure and each time they drop off a painting, they find another answer to their family story. Predictably, they reconcile their own differences, Gaylen and her husband reconnect, and they find out the answers to their questions. In theory, it sounds like a great story. And, in some ways, it is. I just didn't connect with the characters. I didn't care if Gaylen reconciled with Braden. I didn't care if they ever found Truman and found out why he was really in prison. I had to force myself to finish it, and truth be told, I skimmed the last part. It was easy to do and I still didn't miss any details. Thanks to my local library for having a copy I could borrow. If you're so inclined to purchase it, you can do so here . I love Goodreads. It's one of the best things I discovered when I started blogging. I've not only found some new friends, but also a boatload of new books to read. 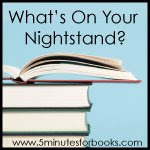 My friend, Amanda, had a post where she blogged about her nightstand and the stack of books on it. Books she hasn't gotten to yet. I have one of those nightstands too... Here's mine and the stack of books waiting to be read. That looks like a lot. But, it won't take me very long. Trust me. Now it's your turn. Go ahead. Show me what stack of books is on your nightstand. And if you're on Goodreads, invite me as a friend. I love getting to know other readers and finding new recommendations! This is the story of twelve years when war, plague, famine, and chaos made their mark on a volatile Italy, and when a young, erratic genius, Michelangelo Buonarroti, made his first great statue - the David. It was to become a symbol, not only of the independence and defiance of the city of Florence, but also of the tortured soul who created it. This is a history of the artist, his times, and one of his most magnificent works. An interesting review of the time and era of Florence at the turn of the 16th century: not only a time of flourishing art, but a time of intrigue and politics. An interesting, but not memorable read. A prince fights for his crown. Narnia... where animals talk... where trees walk... here a battle is about to begin. A prince denied his rightful throne gathers an army in a desperate attempt to rid his land of a false king. But in the end, it is a battle of honor between two men alone that will decide the fate of an entire world. I can't believe I'm admitting this, but I've never read the Chronicles of Narnia before. How did that happen? I have an English degree! I've always meant to correct this literary deficit, but never have managed to do so. After we saw the Prince Caspian movie, my son was insistent on us reading the book. He wanted me to read it first, because he knew I would read it faster than he would. So, I did. I enjoyed it, although it was somewhat anti-climactic for me. I love the Pevensie children. I love that they are a family and they are happy when they are together. Their previous time in Narnia was a joyous time for them, and it's apparent that they regretted leaving. When they are called back by Susan's magic horn, their delight at returning is dulled by the knowledge that the Narnia they found, isn't the Narnia they left. 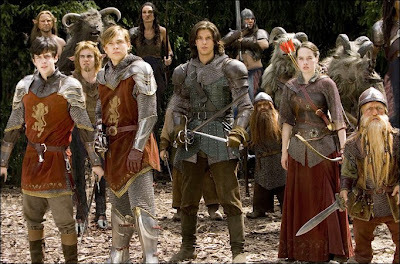 They are drawn back to help Prince Caspian obtain his rightful throne as King of Narnia. After having heard so much praise for so many years about the Lewis' Narnia, I was surprised at how simple and easy it was to read. I suppose I expected more depth and detail. I do love the analogy of only the true believers being able to see Aslan. At first, it is Lucy who can see him and her brothers and sister don't believe her. He tells her that even if they don't follow her, she must follow him anyway. When she finally convinces them to come with her as she follows Aslan, by the end of the journey, each has had their eyes opened to the truth that Aslan has returned. A beautiful allegory. I enjoyed the film immensely. I felt that they captured the spirit of the story, while adding the action and adventure. It was nice to have the Caspian character rounded out a bit more.